Sands Casino Resort Bethlehem takes excitement to a whole new level. Enjoy luxurious accommodations at the Sands Bethlehem Hotel with modern amenities like free WiFi and free on-site parking. Dine at one of the ten restaurants on property including three by world-renowned chef Emeril Lagasse. Find the hottest name-brands at The Outlets at Sands Bethlehem. Experience non-stop entertainment at the new Sands Bethlehem Event Center. And of course our signature style of gaming continues to be the hottest in the area with over 3000 high voltage slot machines and 200 table games including 36 live poker tables. 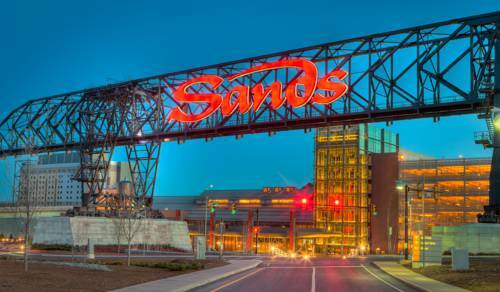 Sands Casino Resort Bethlehem is the premier choice of Pennsylvania Hotels/Resorts and Casinos. Within easy driving distance from New York - only 82 miles/90 minutes. Philadelphia - 50 miles/60 minutes and everywhere in between. Closer than Atlantic City from both locations. FREE Self-park garage with 3300 parking spaces. Valet parking available. BAM Chef Emeril has put his distinctive twist on your favorite American classics. Enjoy prime and grass fed beef burgers-seafood- turkey and veggie selections and much more. Chopstick Asian cuisine serves standout renditions of well known classics using only the finest and freshest ingredients. Open for lunch and dinner. Claes Oldenburg's 1970 sculpture, "Giant Three Way Plug, Scale A," is 10-ft long, made of Cor-Ten steel and bronze. Plugged in near the museum since 2010.